Take on the Citizen Challenge by taking on the Take Home challenge! Sadly, the majority of us use plastic things every day. We can recycle plastic, but a lot of plastic is single-use. Most plastics are not biodegradable and can take hundreds of years to break down. 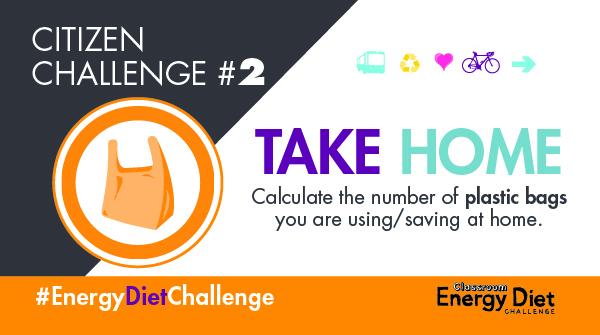 Modelled after one of our 16 Classroom Energy Diet Challenge challenges — Take Home—this challenge invites you to show us your reusable bags and how much you save by using them. Once you’ve gathered your materials, take a pic of yourself with your reusable bags then calculate how much you save by using them in a year. To do so, estimate the number of times per week that you use reusable bags. Multiply this number by 52 then multiply the answer by $0.05. The number given is the estimate amount you save on plastic bags in a year. To enter the contest, take a pic of yourself with your reusable bags and share it with us along with how much you save on plastic bags in a year. Submit the picture and amount to us at info@energydiet.ca or leave a reply to our Citizen Challenge #2 social media posts on Twitter or Facebook. Entries must be received before noon on Friday, April 19th. A draw will take place in the afternoon of Friday, April 19th and three potential winners will be drawn. If eligible, each will receive a $100.00 Shell gift card.